Welcome to our “restful escape” just up the bank from Bells Beach! 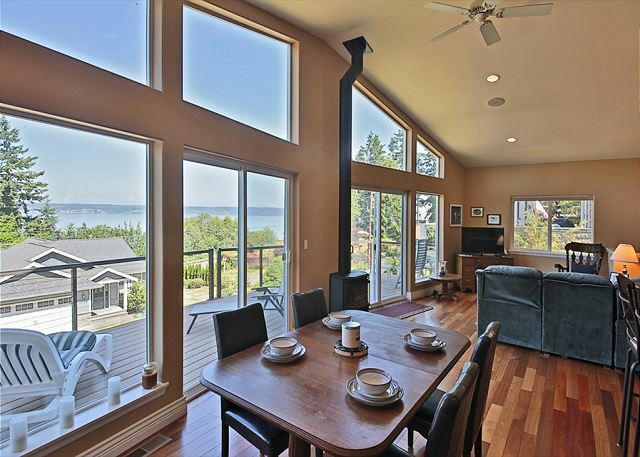 Enjoy north-easterly views of Saratoga Passage, Camano Island and the Cascade mountains from our deck or through our wall of windows. Located just up the hill from Bells Beach, you have beach access with just a short walk down the hill. 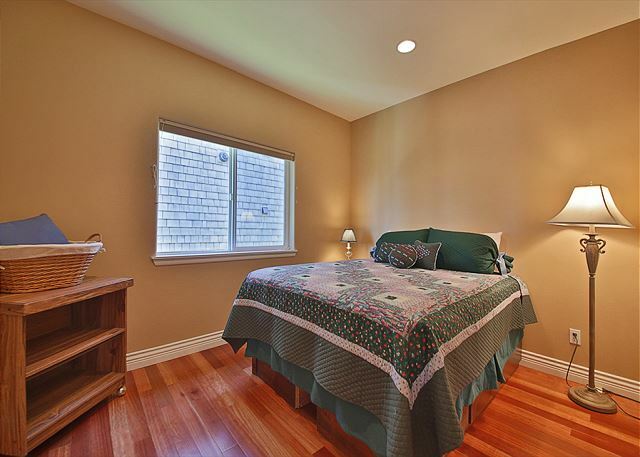 Our comfortable home features one-level living with 2 bedrooms, 2 bathrooms with hardwood floors throughout. The open concept front room features a large kitchen with granite countertops, a wraparound bar seating 6 and a living/dining area with high ceilings and a freestanding propane fireplace. Beyond the sliding glass doors lies a spacious deck, with propane BBQ, where you can relax and enjoy the view. Experience amazing sunrises over the Cascades in the early morning quiet. Lounge on the deck, take in the views and the tranquility. Inside space invites friends and family to gather around games and puzzles. Curl up in the living room on sofa recliners or the queen size futon and read a book, all while keeping an eye out the windows for eagle activity and boats. Stream a movie on the smart TV or recline in one of the bedrooms on either a California king or queen size bed. When you are ready, venture on a short walk down the hill to explore the beach at low tide. If you choose to expand your exploration, both Langley and Freeland are just minutes away by car. Hiking is plentiful on the island, with Saratoga Woods trails just 2 miles away providing quiet, level trails great for families. We had a fabulous time staying on the island. The home was a great distance from town. The view from the house of the water and mountains was glorious! All the amenities needed for cooking were there, which was fabulous. We would definitely stay there again and again. Thank you for your comments. 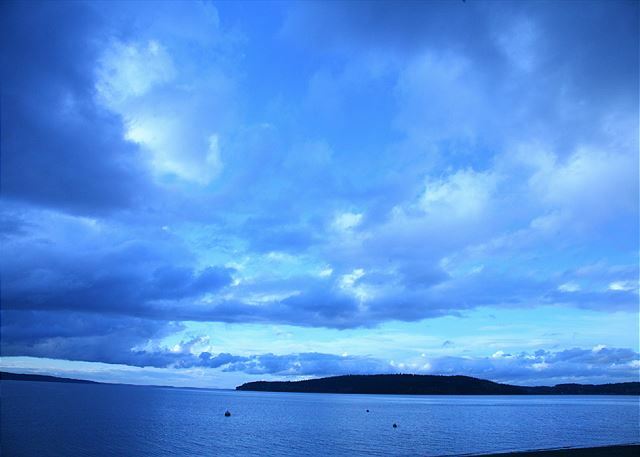 WE are so happy that you found your stay on Whidbey Island so enjoyable and "glorious". Langley is about a five minute drive from Bells Ridge Retreat, but the drive down Saratoga Road more that makes up for the time taveled. . We will be more than happy to help you with your next stay on the Island. We really enjoyed this house. It is just as pictured, nice and roomy. We loved the deck, even though the smoke didn't clear for the whole week! On our last morning, we finally saw the land across the water. My brother lives up the street and he and his wife came for dinner and there was plenty of room for the six of us. We hope to return next year! Great house and quiet location. Loved the little town of Langley. Thank you for your comments. We are happy you "enjoyed" your stay on Whdibey, sorry about the smoke but when we help you next year hopefully the weather will be better for you. This house was perfect for our family of 5. The view of the passage and the wonderful windows and deck make it very relaxing. 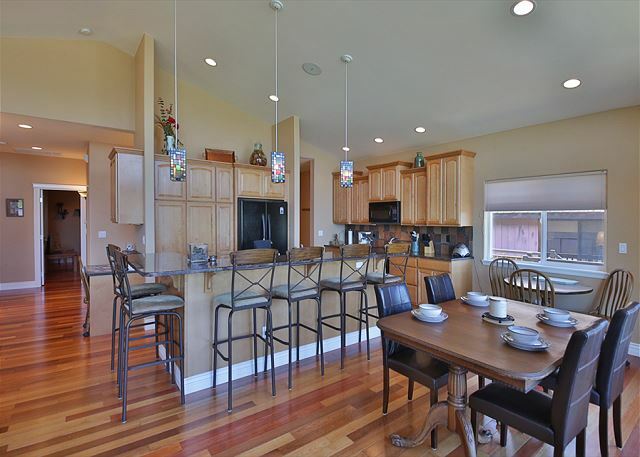 The open layout of the kitchen and living room (and deck area) are perfect for gathering after a full day of adventure. Thank you for your comments. 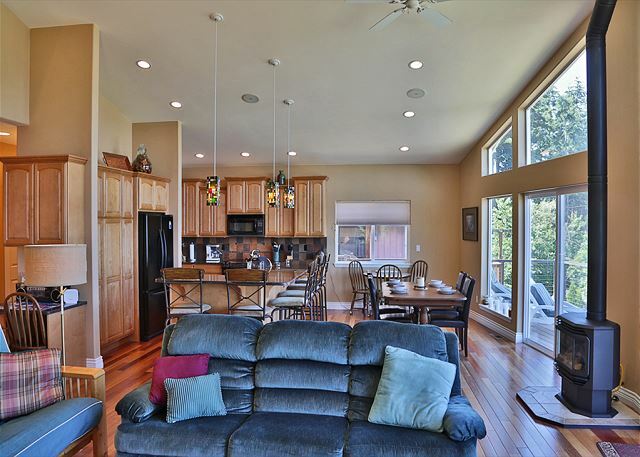 We are happy the "house was perfect" for your family and you had a "relaxing" time on Whidbey Island. We hope we can help you with your next stay on the Island. Overall, an okay stay, with lovely views of the water and mountains, especially at sunrise. 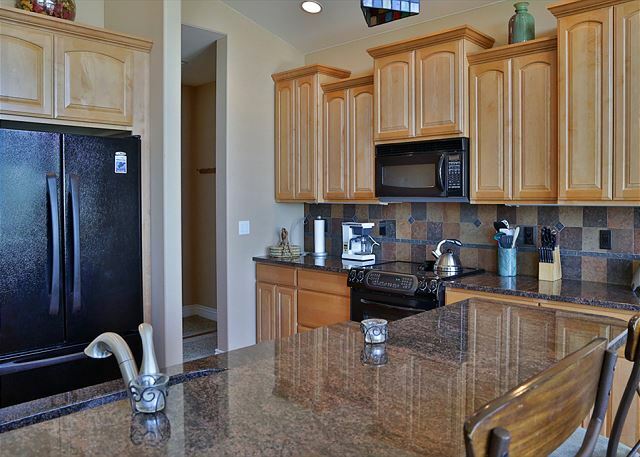 Very clean, good appliances, everything functioned well and we had no problems. 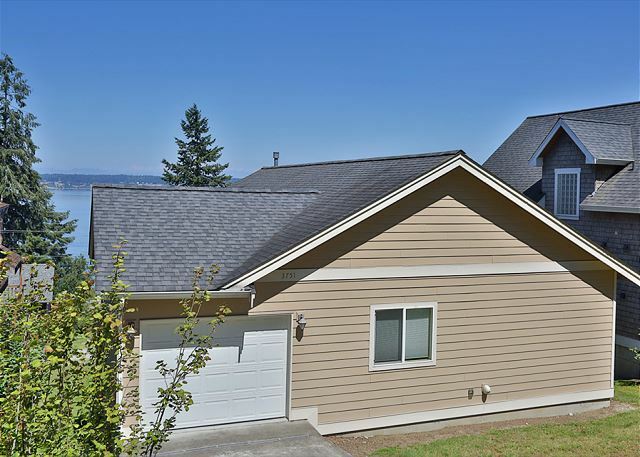 Location is good, in a quiet neighborhood just a few miles to either Freeland or Langley. Couple of caveats if you're thinking of staying here: driveway is tricky into garage- I'd recommend a smallish car rather than a large SUV. And from a comfort standpoint- not much in the way of nice furniture. The pros of this- it would be perfect for a family with kids who might be a little rough on things. The cons- if you like even a little luxury in your vacations, you will not find it here. The furniture, sheets and towels could really use an upgrade. 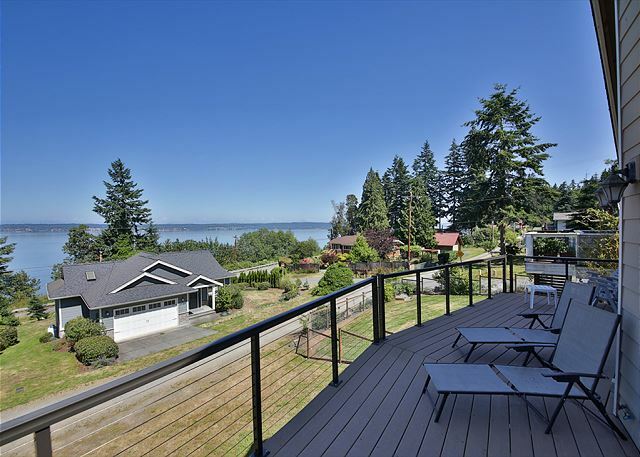 A beautiful place To relax on Whidbey! What a lovely home! Great view of the ocean from the deck! Beautiful well equipped kitchen! 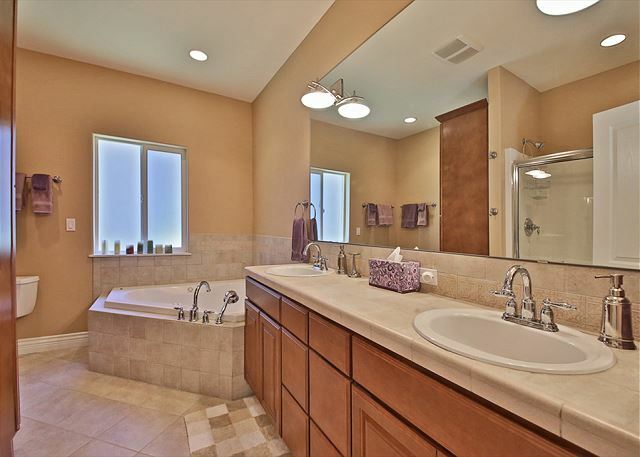 Lovely Master bath! We have stayed at several places on Whidbey and this is one of our favorites! We’ll be back! Thank you for your review. We're happy to hear you loved this vacation home. 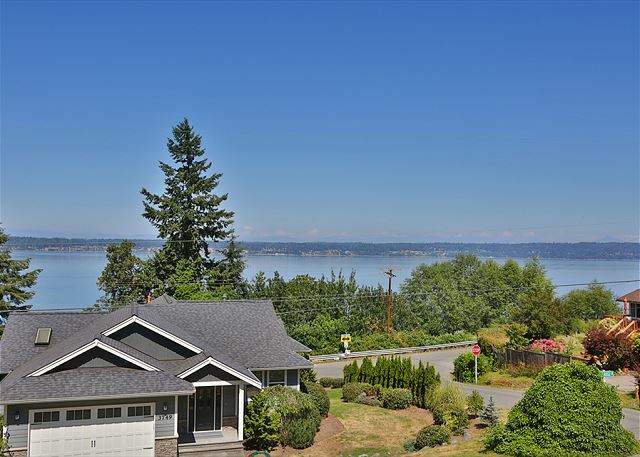 We do have some great views on Whidbey Island and it's nice to hear you want to return. The house is beautiful and calming - the natural light and view make for just a relaxing enjoyable time. The driveway is a little interesting - and with two kids - getting to the front door was interesting the first time (then we just went through the garage and it was totally fine) -- we found everything we needed and the soaker tub was amazing. Thank you for your review! Happy to hear you loved this vacation home and that you had a good time. Amazing views with sunrise and sunsets that inspire every day. 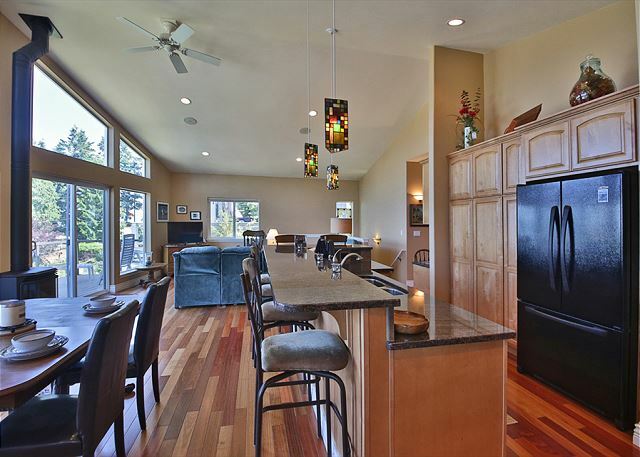 Kitchen with everything you need and a wonderful bar for informal gathering and dining. Exceptionally clean and inviting. Plenty of towels and bed linen with the exception of the futon. Close to restaurants. Park only in front of property. Need a walkway or steps from the road to the house. Grass is often slippery trying to climb the hill. 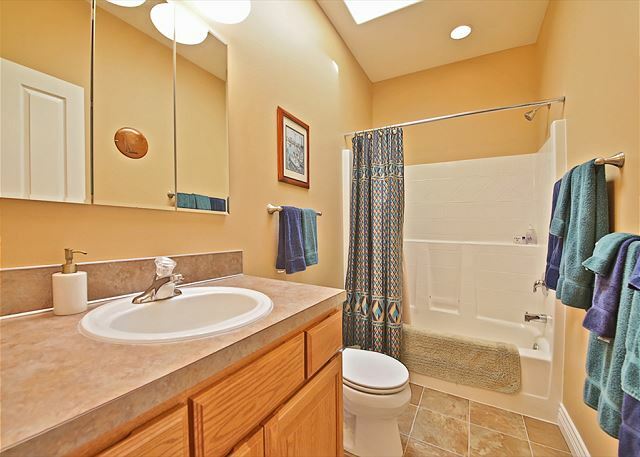 Master Bath is great but needs light bulbs replaced. The futon is hard to set up and feels like an afterthought as a sleeping place. 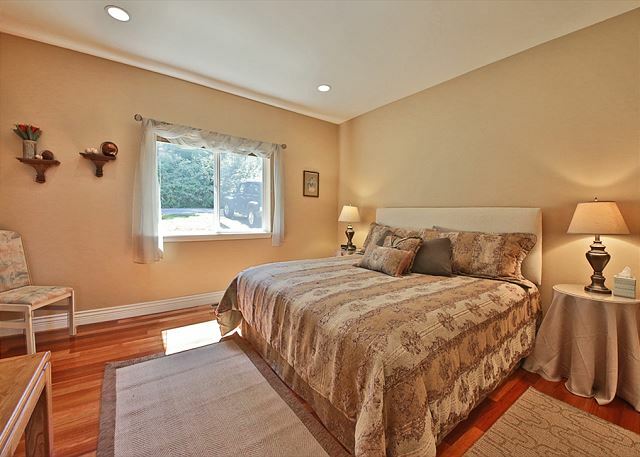 The 2nd bedroom could use a small chest of drawers and a short stool to get up to the high bed. All of these can be easily remedied for such an excellent property. Thank you so much for your review. Happy to hear you got to see some of our amazing views daily. There is nothing like a great sunrise to start your day. We strive everyday to have homes very clean as it's a number one priority for us. Thank you for your suggestions on this home and we will pass them on. The home was beautiful and clean. Exactly as described. Thank you for your comments. We are happy the location and home on the Island was "exactly as described". 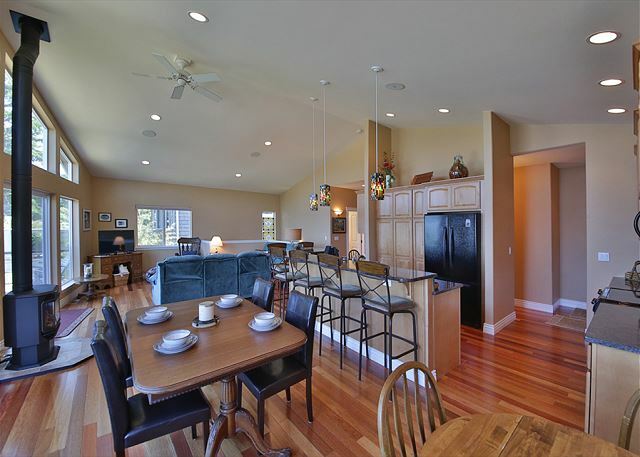 We hope to help you with your next stay on Whidbey Isaland. The house was beautiful, clean and spacious. We had everything we needed during our stay. Thank you for your comments. We are happy you "had everything you needed" during your stay. We hope to help you with your future stays on Whidbey Island. 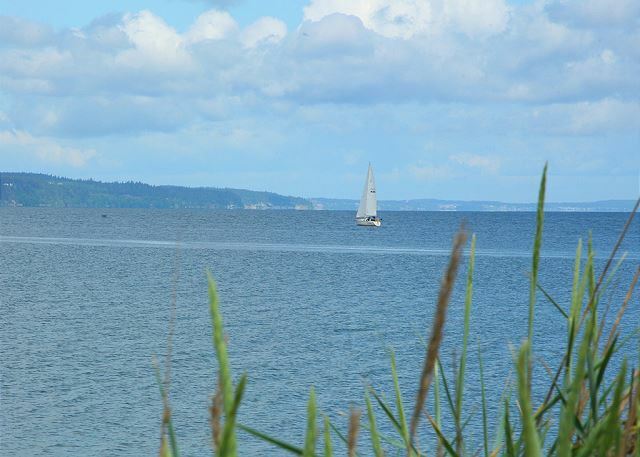 We enjoy going to the south end of Whidbey Island to escape the busy life. 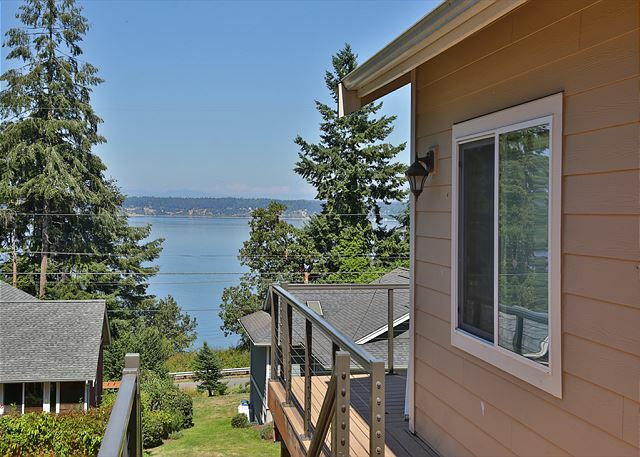 Bells Rigde is located a few miles north of Langley and is the perfect location with easy access to shopping, dining, biking, hiking, or just relaxing with a good book or watching the birds and boats go buy. Thank you for your comments, we are glad you "enjoyed" your stay on Whidbey Island! We hope to help you with your next stay on the Island. House was nice , view was great, plenty of towels and dishes , bbq ECT. Thank you for your comments. We have made our staff aware of your concerns, thank you. We hope to help you with your next vacation on Whidbey Island. 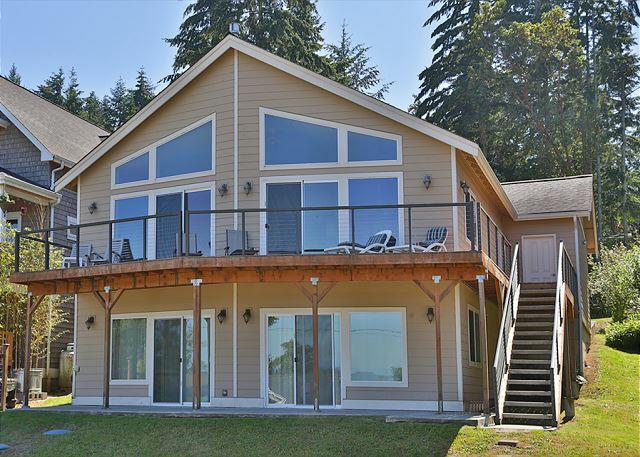 Nice retreat home on Whidbey Island with terrific view! Very nice home. Spacious with great layout and wonderful view. The approach to and parking on the concrete pad at the rear of the home is treacherous and poorly designed. Very well stocked kitchen. Plenty of linens and towels. Excellent wifi service; cable reception is spotty. Needs a deep clean under the furniture and beds. Information provided by the rental agency before arrival was helpful; there was no need to contact them during our stay. The home is well built; all systems and appliances are in good confition; table and floor lighting could be improved. The screens for the sliding doors need attention; cheaply made and were difficult to open, not only by us but had evidence of others struggling to use them. The tracks need lubricated from exposure to salt air. Overall the home is a nice retreat and comfortable. Whidbey Island is a beautiful vacation destination. Thank you for your review and feedback. We have addressed the cleanliness issues with our staff and have lubricated the screen doors. We have brought the lighting issues you have mentioned to the attention of the owner of the property. Thank you once again for the feedback. 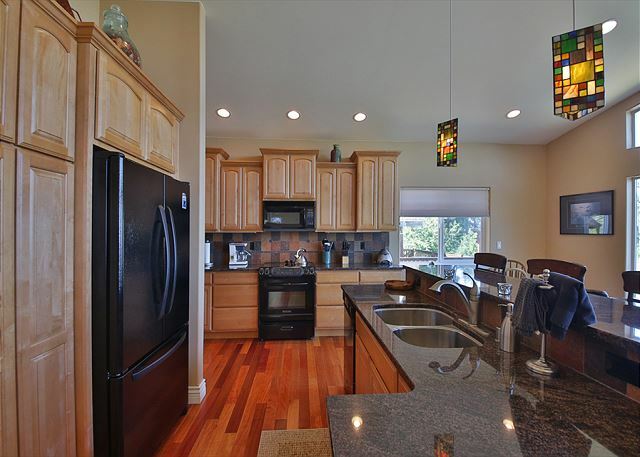 Beautiful home with wood floors, open concept of living room/kitchen, spacious, beautiful view, beds are comfortable. We've stayed at many rental homes on Whidbey and find most homes beautifully furnished, although some owners skimp on bedding that does not lend to comfort. This home offers nice beds for a good nights' sleep! P.S. The property manager gave us the wrong code for the lock on the door and was helpful when we called about the issue. Thank you! We are so happy that you were satisfied with the layout of the home and with the bedding. We apologize that you initially received the wrong code, but we're glad things got worked out smoothly. Thank you for your review! Wow View Upon Entering the Home! My girlfriend I take an annual trip to Langley and so we chose this house based on the pictures and cost. Upon entering the home you are immediately struck with this "wow" view, We thought the owners probably did some recent upgrading--all wooden floors, very nice bathrooms and kitchen, and comfortable beds. We were however, disappointed to discover only a few TV channels. The driveway also was a little risky, narrow with a small drop off on each side. All said and done we would definitely recommend this home to others. We're so glad you enjoyed the view and the furnishings. We apologize that you were disappointed with the TV channels--this house is not advertised as having cable (and doesn't have it), so yes, there are very few channels. The TV in the main room is a SmartTV, so there are apps for ESPN, Netflix, streaming, etc. The TV in the master has a BlueRay player. The driveway is a single car-width driveway into the garage and there is also the option of parking down below on the other side of the house (which is totally flat). We hope you'll come back soon! Thanks for your review! Overall the house was awesome!! a few things to consider tho, now that we rented. There is really no TV! We had 6 channels total, which went in & out the whole time, which didn't matter because 1 was a Japanese channel, another was the WA State legislature channel & a French channel!! There isn't any beach access. It's concrete retaining walls all up & down the beach. Like I said house was very nice, stocked well with great deck & view. They just need to be a little more upfront about TV & beach access. Thank you for your review! 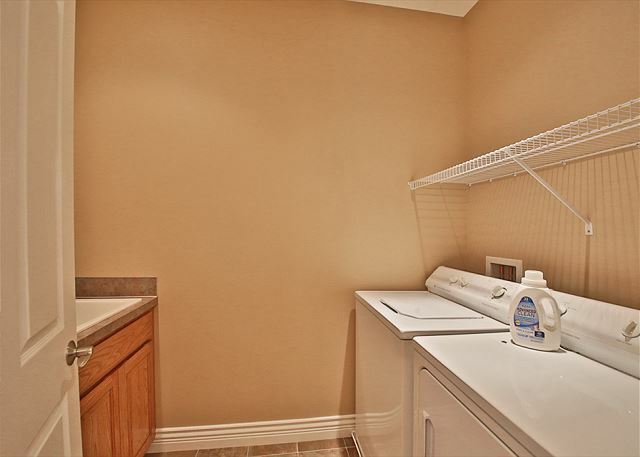 We are so sorry that you were disappointed in a few features of this rental. In this home, cable is not listed on the amenities. In the main room there is a SmartTV, on which you can stream with programs like Netflix, Hulu, etc. In the master bedroom there's a BlueRay player where you can also stream. There is beach access, but you must have gone down there when the tide was all the way in. When the tide is high, it probably does reach the retaining wall. When the tide is out, there's plenty of beach to walk around on and enjoy. Thank you for your helpful comments that allow us to make things more clear for our future guests. We're glad you still enjoyed your stay! This was a wonderful house to stay in for our weekend on Whidbey. 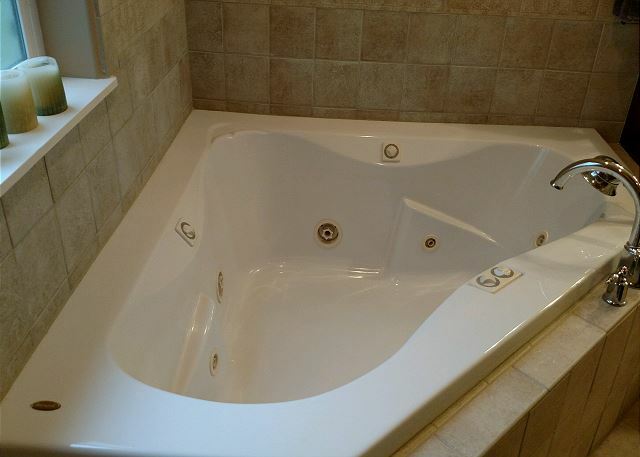 It had all the amenities that were stated, the house was clean and the beds were comfortable. 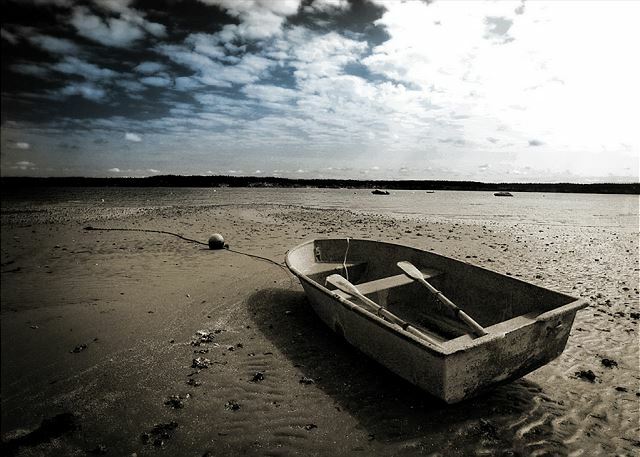 This property was in a great location with water views. It is very spacious and has the feeling of a retreat. Everything was well organized, clean and well maintained. We enjoyed visiting the Island wineries on a wine and chocolate tour and found lots to do and see in Langley, Coupeville and LaConner as well as some good hiking around Deception Pass. I will definitely recommend this property to family and friends. Thank you so much for your review. 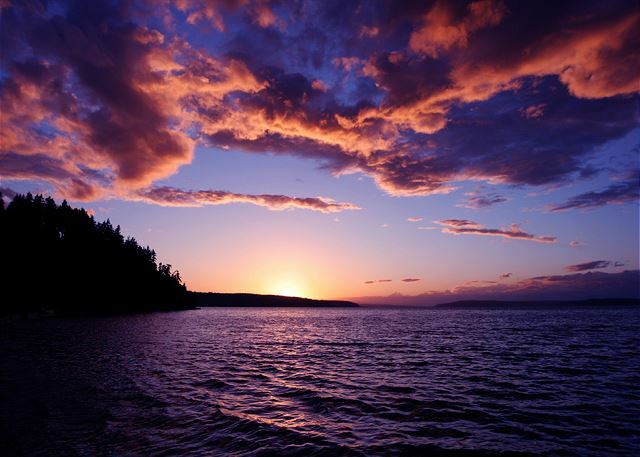 There is so much to do on Whidbey Island, sights, trails, views, shops and more. We're happy you had a great time. The home was beautiful and exactly as described! View was beautiful and fireplace made it cozy! We had a couple of issues which were quickly resolved when Josh came over and fixed them. Definitely would recommend it to our friends and we will be back! Thank you so much for your review. 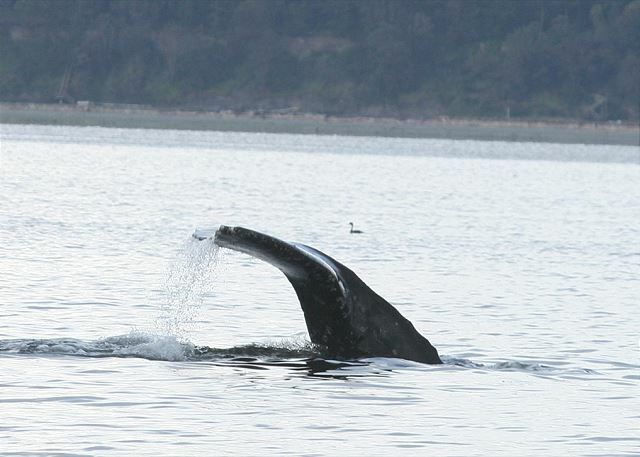 It's nice to hear you had a great visit to Whidbey Island. Beautiful views from front windows. Garage was a plus. Home was very clean and well equipped. Exceptions: Definitely needs an iron/ironing board and ceiling fan in guest bedroom. Glad to hear you loved the views. We're glad you had a nice time on Whidbey Island. For future guest, we do have a loaner ironing board in our office. Please feel free to call anytime and we would be happy to run it over. Beautiful, well-appointed home. Very comfortable for our family of four. It was clean and cozy and the VIEW was stunning. We enjoyed the short drive in to Langley for a couple of meals. Really enjoyed the Village Pizzeria and Useless Bay Coffee Company and Whidbey Island Kayaking. Also spent a day at Double Bluff Beach in Freeland (full grocery store there, too, fyi). And you cannot go to Whidbey without at least a day in Coupeville. We sailed in the bay and enjoyed Penn Cove mussels at the Front Street Grill afterward. Really lovely stay. Nice to hear you had a great time on Whidbey Island. 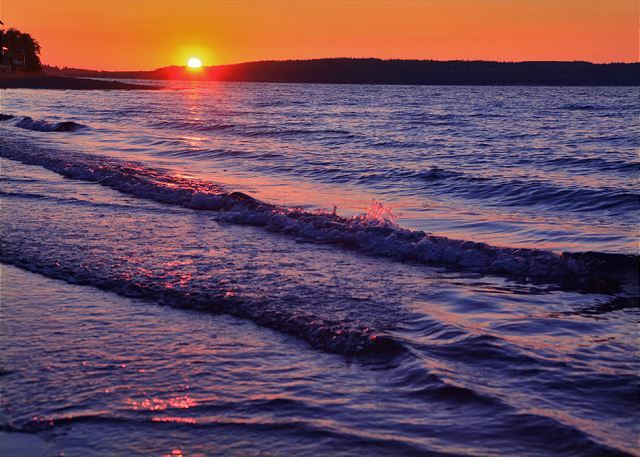 We're so glad that you enjoyed the sunsets, location and the small towns that have lots to do. Thanks for your review. 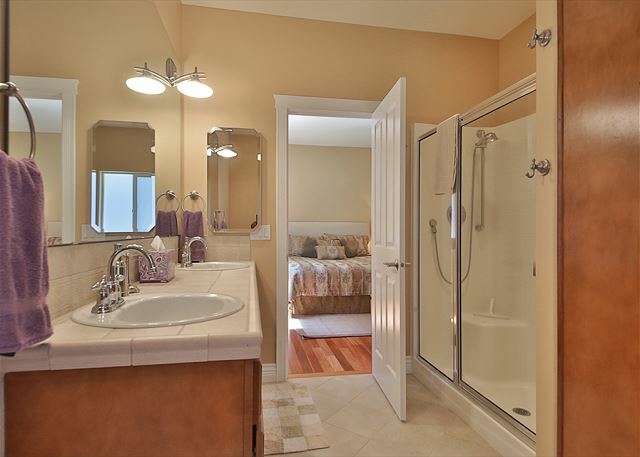 We were very satisfied with this home and amenities. Josh in Tara Realty promptly provided answers to our questions. This house is in a subdivision which is quiet even though the houses are close. View and deck are very nice. Thanks so much for your review. We're glad to hear you liked the home and were able to enjoy the view. Thanks for the comment regarding Josh. nice rental with a great view, open layout, clean, newly updated, worked well for us. We're glad that you enjoyed the open layout and the view! Thank you for your review!